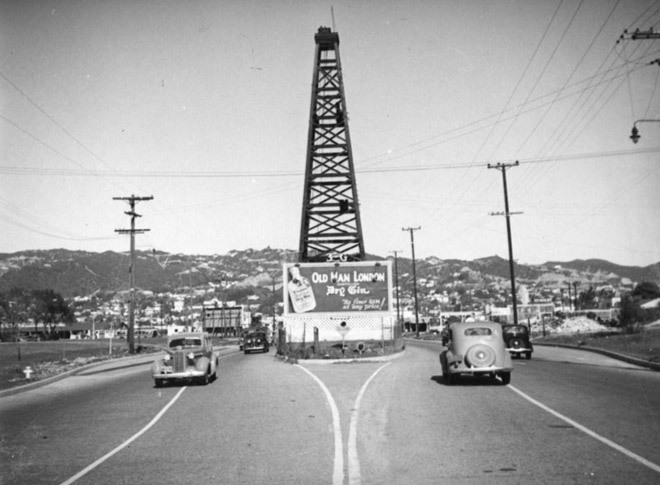 Petroleum provided the raw materials for the gasoline that powered Angelenos’ automobiles as well as the asphalt on which they drove, so in one sense the middle of La Cienega Boulevard was a fitting place for an oil derrick. But many failed to see the logic. For decades, photos of this bizarrely located well, which sipped some 600,000 barrels of crude oil from the ground over its nearly 40-year lifespan, circulated around the world as visual proof of Los Angeles’ eccentricity. La Cienega did not yet extend through the area when the derrick went up in 1907. Then, bean fields covered the present-day site of the Beverly Center, and Southern California was in the middle of an oil boom that brought riches and rapid industrialization. As Edward L. Doheny had discovered when he struck oil near Echo Park in 1892, the sedimentary strata that underlie the Los Angeles Basin were home to some of the richest oil fields in the nation. Wooden derricks, built from imported Pacific Northwest lumber, towered over beaches, schools, and orange groves across the region. When the city of Los Angeles decided to extend La Cienega in 1929, the well happened to stand directly in the street’s path, just south of its intersection with Beverly Boulevard. Unable to reach an agreement with the well’s owners over its value, the city compromised and agreed to bend traffic lanes around the well. The unusual traffic hazard, which hosted billboards advertising hard liquor, became a landmark. It even attracted the attention of Ansel Adams, who photographed it in the early 1940s as part of a Fortune magazine series on Los Angeles. In 1946, the derrick finally came down after the city acquired title to the narrow strip of land. Today, the Beverly Center rises over the roadway, now free of obstructions but often choked with traffic. Southern California’s oil boom, meanwhile, has long since peaked. But though extraction has waned, roughly 3,000 wells—many of them cleverly disguised—continue to pump black gold from the sands beneath the city.